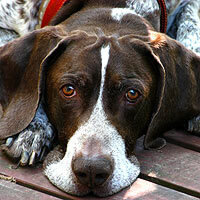 I have always had a German Shorthaired Pointer in my life. I traveled with my father around the country participating in junior showmanship, a sanctioned event for children, ages 10-18, to teach proper dog handling at shows, for years. It was one of the best memories of growing up. I am now in my 40’s. The last dog I obtained with my dad was Dirk or as we call him, Dirkster. My father passed away in 2008, so Dirk has an extra special place in my heart. Recently, the yard crew left the gate open and Dirk ran off without us knowing. A lady in our neighborhood located him running back and forth across a main street into a wooded area. She was able to kennel him and she contacted HomeAgain. They contacted me and I arranged to get Dirk back upon her return home. He was safe and happy! I have never had a dog microchipped prior to this year and I will have every dog I ever own in the future chipped.